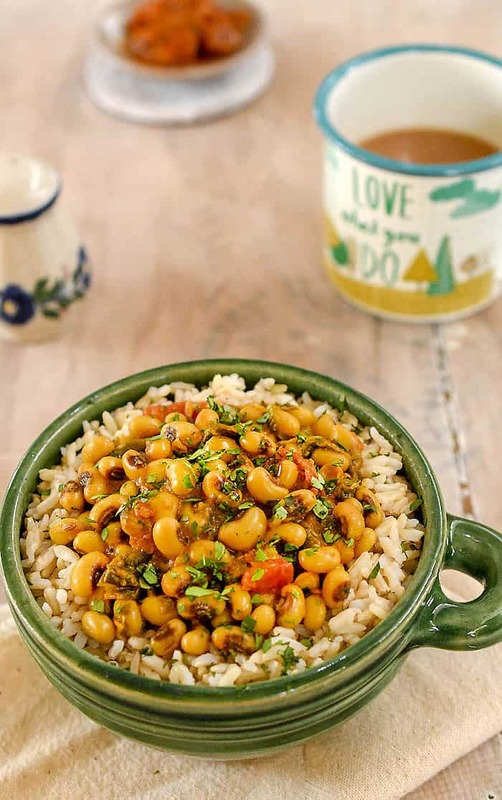 TodayI have another black-eyed pea recipe for you and it’s from Indian Instant Pot Cookbook by Urvashi Pitre. 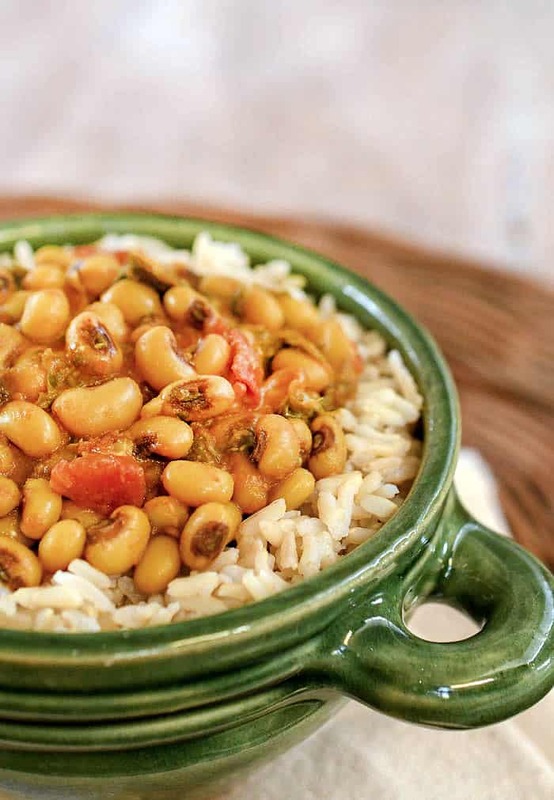 This simple, healthy recipe for Black-Eyed Pea Curry with Spinach is made in your Instant Pot and is delightful! I really love Urvashi’s book, especially that she gives you spice blend recipes and recommendation. Spices are so important in Indian cooking. 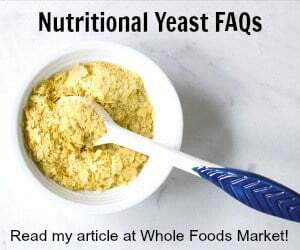 Below you can watch me make the recipe and see just how easy it is! 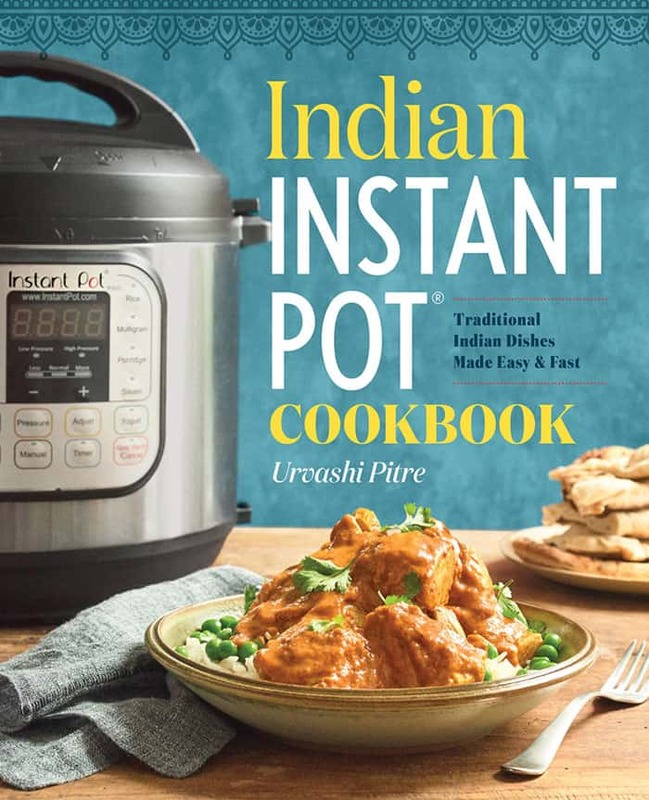 The Indian Instant Pot Cookbook is not vegan, but it does have tons of vegetarian recipes that can be easily veganized with nondairy yogurt, vegan milk, and vegan butter or oil. 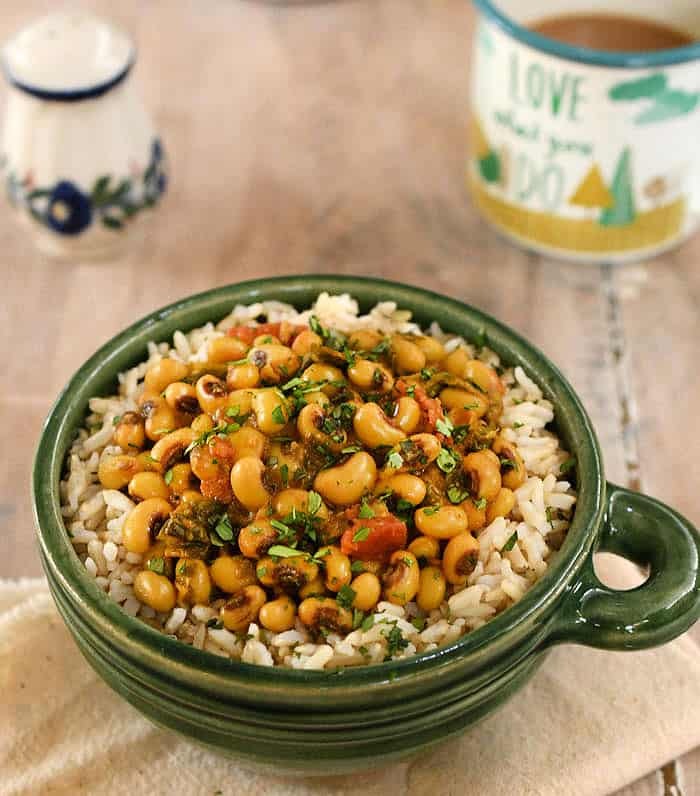 It also has some accidentally vegan ones like this black-eyed pea curry too. I’m going to try veganizing some of the chicken recipes with soy curls or chickpeas. And don’t forget that tofu is a great substitute for paneer. "Whenever I was feeling particularly lazy, I would make Punjabi lobia. I would use canned beans, and the taste would be okay. Then I realized that you could make perfectly cooked black-eyed peas in 10 minutes in a pressure cooker. Now we have this much more often, and it is so much better. Chop one tomato, and everything else is pour and cook. The end result is a creamy, full-bodied bean and spinach dish that makes an excellent weeknight supper. As always, adjust the cayenne to your heat preference. - Urvashi Pitre"
Preheat the Instant Pot® by selecting Sauté and adjusting to More for high heat. When the inner cooking pot is hot, add the oil and heat until it is shimmering and add the cumin seeds and mustard seeds (if using). They will begin to sputter like popcorn popping. Add the garlic and ginger and sauté for 30 seconds. Add the tomato and cook for 1 to 2 minutes until the tomato is softened. Add the turmeric, cayenne, cumin, coriander, and salt, and mix well. Add the black-eyed peas and water, and mix. Place the spinach on top. Lock the lid into place. Select Manual and adjust the pressure to High. Cook for 10 minutes. Allow 10 minutes of natural pressure release, then quick release any remaining pressure. When the cooking is complete, unlock and remove the lid. Stir and taste, adding more salt or cayenne if necessary. Serve with rice, chapattis, or naan. Thank you so much for sharing this recipe! Your pictures are GORGEOUS and your descriptions are right on. So nicely done! I am poking around your site now for other recipes. Your recipe is now in regular rotation at my house – it’s so good!! So you can put in unsoaked dry beans? I would invest in a stainless steel insert, once the coated inner pot is scratched its no longer safe to use. These remarks are about being helpful, and i hope you take them as such. You can use Ghee instead of peanut oil. I am making this tonight – the photo looks like the spinach is missing – shouldn’t it be green, almost like a saag? Can you use canned peas instead of dried? Yes, you would need to reduce the water too. I love curry AND love black eyed peas! LOVE THEM! This looks to die for and I’m pinning so I can give it a go! Made this for lunch today and it was delicious. It was runnier than I expected, so I used an immersion blender for a few blasts and that thickened it up a bit. Taste was great though. Thanks.